The FaithWeaver NOW® Parent Handbook weaves transformative experiences into every lesson and includes activities that help parents make the Bible unforgettable for their families. FaithWeaver NOW Parent is a small group resource for veteran parents, grandparents, and newbies! 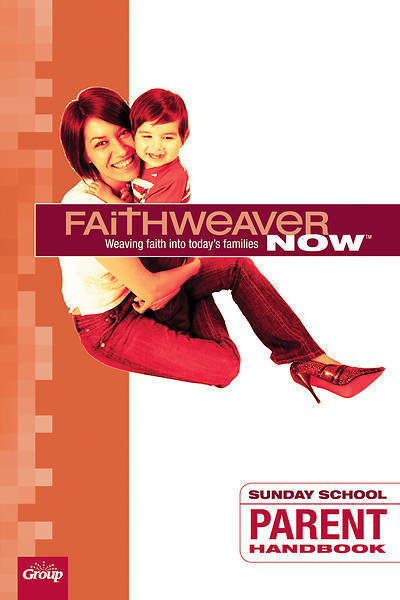 FaithWeaver NOW Parent empowers and equips parents to have confident faith conversations with their kids: Busy parents don't have to put something new on their calendars—FaithWeaver NOW Parent occurs during regular adult Sunday school (no extra trips to church!). Parents are equipped with the Bible background, why the lesson matters, what it means, and how it relates to everyday life—correlating with the same lesson their children are learning. Powerful things happen when parents share ideas, mentor and fellowship with one another. Here’s what you’ll find in your FaithWeaver NOW® Parent Handbook—including how to use each piece to get the most out of each week: BIBLE BACKGROUND—This is a more in-depth look at the week’s Bible passage. Use it to gain a deeper understanding of God’s Word. WEAVING FAITH INTO FAMILIES—This brief devotion will help you think through how this week’s lesson applies to your family and how to pray for them this week. DISCUSSION QUESTIONS—These are the questions you’ll go through as a group, including the specific passages you’ll look at. Use this page to follow along during the lesson. NOTES—Use this space to write your thoughts, discoveries, and great ideas from other parents. INSIGHT FOR PARENTS—Each week, you get a hands-on idea to take what you’ve learned and share with your kids. You’ll practice these ideas with your group, too! FAITH TALK STARTER—These quick tips will help you have confident conversations about faith with your kids. Use one, or use them all. PRAYER STARTER—You’ve learned a lot today, and you can’t wait to share it with your kids. But you know you need God’s help. Use this prayer starter to talk to God. There’s a little extra room to write out your prayers, if you’d like.